We are located in the lively Ximending area that is fun always. Once there walking from Ximen MRT (Exit 6) to Ximen Backpackers Home takes just 6 minutes. 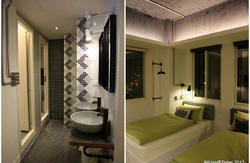 Ximen New Moon has 16 rooms, each of them has bathroom inside. We provide WiFi and cable adsl in room and public space so you can enjoy your ipad or iphone everywhere. Please go to our check in Center when you arrive in Taipei. As we don't have a 24 hour reception, please inform us about your arrival time. Check-in is by appointment. If your arrival time is changed, please contact us ASAP. Thanks. You'll probably be arriving from Taoyuan International Airport (formerly called Chiang Kai-Shek Airport). You could take a taxi directly to the hostel, but it's cheaper to take the bus and MRT. MRT stands for Mass Rapid Transit, which is what the Taiwanese call their metro/tube/subway system. It's a 40 ~ 50 minutes bus ride from the airport to central Taipei, then a quick only one stop to come down to Ximen Station which will place you within 6 minutes' walking distance of the hostel. Read below for detailed directions. 1) Please give us an accurate arrival time when you call, reserve online, or email us. Keep us updated on any changes or delays in your schedule so that we can be sure someone is around to let you in. 2) If you have any trouble finding your way here, call us by payphone. Coin-operated payphones can be located at the bus station in the airport, Taipei Main Station, and Ximen MRT Station. We speak English and Chinese.We are always very happy to help you. You buy bus tickets before boarding at ticket counters, which are located in the Arrival Passenger Reception Areas of both Terminals of the airport. Here you can also find free travel info and maps. The attendants speak English and can help you buy a bus ticket for Taipei Main Station, which costs about 130 Taiwan dollars (US $5). From Taipei Main Station, Ximen Station is only one stop west on the Blue Line. Buy your MRT token from a machine (20 NTD) which lets you through the turnstile. Retrieve your token after you pass through--you'll need it for when you exit the MRT at Xinen Station. Board a train heading towards either Yongning or Far Eastern Memorial Hospital, which both pass through Ximen. When you arrive at Ximen Station, head to Exit 6 (the elevator). Please see Picture #9 for a detailed map, then follow up the map by 6 mins walking you will find our Check-In Center. The trip should cost about 1300 ~ 1500 Taiwan dollars (up US $40), compared to the 150 Taiwan dollars the bus + MRT costs, detailed below. Most taxi drivers do not speak English, so so be certain to have a printout of the Chinese address and directions with you or to call us from the airport to tell us when to expect you.